Dr. Müller Syrups differ from each other by their content of extracts. 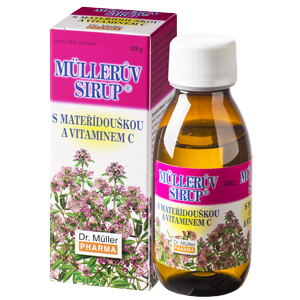 All of them contain vitamin C. Dr. Müller Syrups are prepared with Iceland Moss, Sea Buckthorn, Plantain and Wild Thyme, Plantain and Honey, Wild Thyme, Marshmallow, or Echinacea. Many of them are sugar-free. Dr. Müller syrups are convenient both for adults and children and you can combine them well with Dr. Müller Pastilles and Dr. Müller Teas. 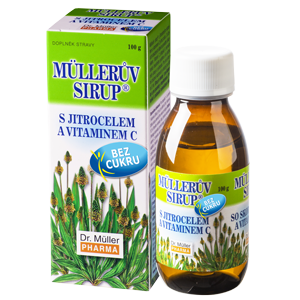 Dr. Müller Syrup contains the extract of Plantain and vitamin C. Its delicious taste makes it good for children aged 3 and up. Composition: Invert sugar, purified water, honey, extract of ribwort plantain [water, ribwort plantain (Plantago lanceolata), potassium sorbate], vitamin C (L-ascorbic acid, sodium -L-ascorbate), preservative (potassium sorbate). 1 tea spoon (5 ml) 3-5 times daily (adults); 1 tea spoon (5 ml) of the syrup daily (children aged 3 and up). The syrup can be used either as such, or in a drink. Do not exceed the recommended doses. The product does not substitute varied diet. Not suitable for children up to the age of 3. Keep out of the sight and reach of children. Note: Shake before use! Store in a dry place at temperatures between +5 ° C to +25 °C. Once opened, keep the bottle tightly closed in a cool dark place. Composition: Invert sugar, purified water, extract of ribwort plantain leaf [water, ribwort plantain (Plantago lanceolata), potassium sorbate], vitamin C (L-ascorbic acid, sodium -L-ascorbate), preservative (potassium sorbate). Dr. Müller Syrup contains the extract of Plantain and vitamin C. Its delicious taste makes it good for children aged 3 and up. The syrup is also convenient for patients suffering from phenylketonuria. Composition: Purified water, sweetener (maltitol), extract of ribwort plantain leaf [water, jitrocel kopinatý (Plantago lanceolata), potassium sorbate], vitamin C (L-ascorbic acid, sodium -L-ascorbate), thickener (xanthan), sweetener (acesulfam K), preservative (potassium sorbate). Do not exceed the recommended doses. The product does not substitute varied diet. Excessive use can have laxative effect. Not suitable for children up to the age of 3. Keep out of the sight and reach of children. 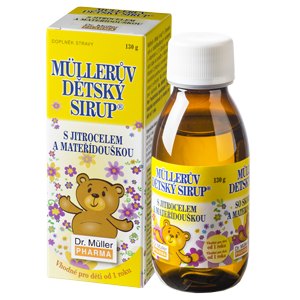 Dr. Müller Syrup contains the extract of Wild Thyme and vitamin C. Its delicious taste makes it good for children aged 3 and up. Composition: Invert sugar, purified water, extract of wild thyme herb [water, wild thyme (Thymus serpyllum), potassium sorbate], vitamin C (L-ascorbic acid, sodium -L-ascorbate), preservative (potassium sorbate). 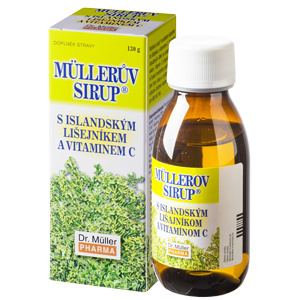 Dr. Müller Syrup contains the extract of Iceland Moss and vitamin C. Its delicious taste makes it good for children aged 3 and up. Composition: Invert sugar, purified water, extract of Iceland moss [Iceland moss (Cetrariae islandicae), glucose], vitamin C (L-ascorbic acid, sodium -L-ascorbate), preservative (potassium sorbate). 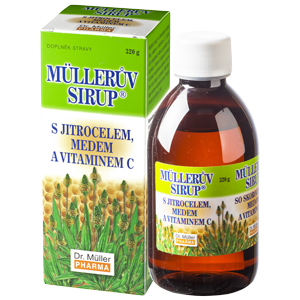 Dr. Müller Syrup contains the extract of plantain and wild thyme and vitamin C. It has delicious taste. According to the statement of the Czech Paediatric Association, member of the Czech Medical Association, the product is suitable for children aged 1 and up. Composition: Invert sugar, purified water, extract of wild thyme [water, wild thyme (Thymus serpyllum), potassium sorbate], extract of plantain leaf [water, ribwort plantain (Plantago lanceolata), potassium sorbate], vitamin C (L-ascorbic acid, sodium -L-ascorbate), preservative (potassium sorbate). 1 tea spoon (5 ml) daily (children aged 1 and up); 1 tea spoon (5 ml) 1-3 times daily (children aged 3 and up), 1 tea spoon (5 ml) 3-5 times daily (children aged 12 and up and adults). *Salt in the product comes only from naturally occurring sodium in sodium ascorbate (vit. C). Do not exceed the recommended doses. The product does not substitute varied diet. It is suitable for pregnant and breast-feeding women. Keep out of the sight and reach of children.